Mom's Gone Bronson! : Super-Quick Curd Tarts! Yum! 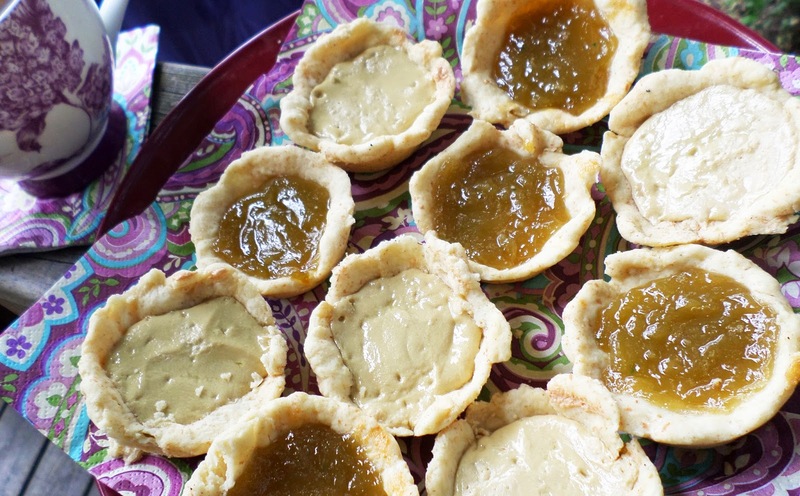 Here is a super-quick sweet-treat for you to pop out this summer - Curd Tarts! All you have to do is get a box of pie crust mix OR mix up a pie crust of your own and roll it out. Cut out circles to form little mini pies in a 12 cup cake pan and then spoon in the curd of your choice! We love to use lime curd or banana curd but lemon curd and any other kind of curd works just as well! Pop the tars in the oven and bake until the pie crust is ready! Take them out, set them down to cool - do not remove them from the baking pan until they are fully cooled or else they may fall apart! Slowly pop them out of the baking tray and onto a serving plate or platter and away you go! Curd Tarts for everyone!